In an adaptation of the Dürrenmatt play, Ingrid Bergman is the richest woman in the world who returns to her impoverished home village. On arriving she promises the peasants riches but only if they execute Anthony Quinn, her former lover and the father of her dead child who, to save his own skin, forced her into exile and prostitution. This is a good dramatic story that might have made a western, though the original play was set in Switzerland, as is this movie version. 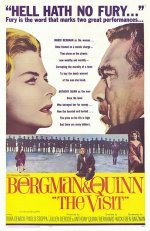 Hollywood changed, that is, softened, the ending and made a stodgy German-Franco-Italian pudding out of it that Quinn (who also produced) and Bergman can't quite bring to life.